¨ Function - A hierarchical list of Top Level Business functions that the business carries out. ¨ Activity - A high Level logical grouping of business processes carried out by one or more departments. ¨ Service - The services the Enterprise consumes or produces. ¨ Product - The products the Enterprise consumes or produces. ¨ Value - Defines what is fair and unfair. ¨ Ethic - Rules of behaviour based on Morals. ¨ Moral - Relates what is right and wrong. ¨ Department - The departmental structure of the Enterprise. ¨ Geography - Physical geographical locations. ¨ Service - A Technology Service used by Functions and activities. ¨ Business Capability - Core business functionality required to fulfil Activities and Functions. ¨ Buildings - Physical structures. ¨ Technical Capability - Core technology functionality required to fulfil Activities and Functions. ¨ Application - The main applications in use. ¨ Datastore - The main groups of data in use. ¨ Device - A generic piece of hardware provided as or part of a service to the business. 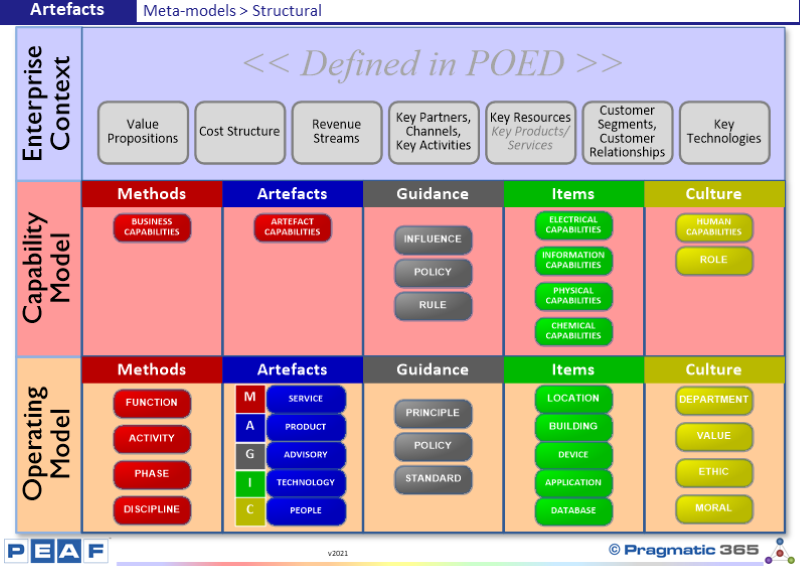 What entities does your Enterprise use to model this information? Are they well known and consistently used from person to person? If not, what problems does that create and what can you do to alleviate them?